An internship can provide a valuable contribution to your undergraduate education and be an attractive component of your resume. 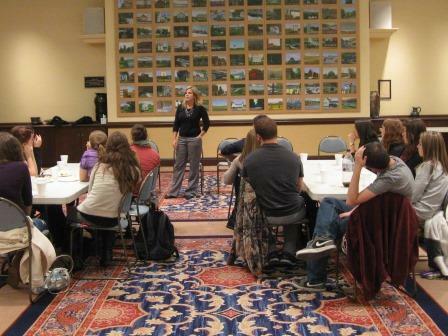 Internships lead to valuable networking opportunities and very frequently to full-time employment after graduation. Click HERE to see some accounting resume samples! 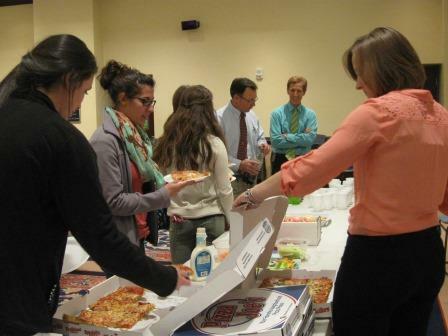 The PICPA sponsored a pizza and accounting careers dinner. 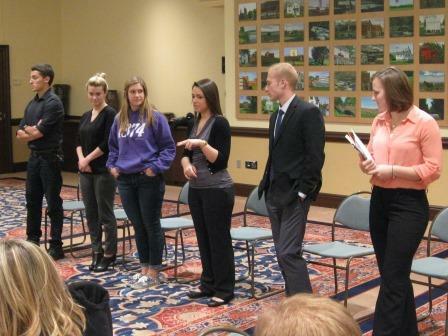 One junior and five senior accounting majors discussed the value of their internships, as well as how they led to future employment offers. 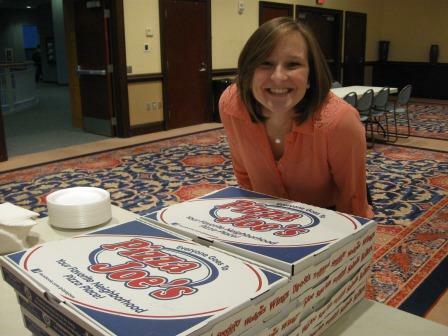 Thanks to PICPA Campus Representative, Julie Powell '15, for organizing. Alyssa Natale '14 , staff accountant with Carbis Walker LLP, informed students about what to expect their first year in the working world and what it takes to pass the Uniform CPA Exam. Professor Smith and Professor Ligo were present to field questions regarding the 150 hour requirement and internship credits. "Some of the financial advisory work I was able to do was learning about betas and how to read certain stock reports and analysis." "It was a great learning experience and I feel I gained an extraordinary advantage over other students who have not had a similar internship experience." "I was constantly busy doing something and I learned so much about the finance industry. I also learned about investing for retirement and the many different options that people are faced with including 401(k)s, annuities, mutual funds, and third party active investment agencies." "Over the past few months my internship taught me just as much as most of my classes during the past four years. This experience was more valuable to me than I ever thought that it would be." "The supervisors were amazing. I had a blast participating in this internship and I am looking forward to continuing on next year." "I was able to apply a great deal of accounting principles I learned at Westminster to the VITA program." "Not only was I able to learn a lot about the public accounting industry, but I also learned a lot about myself." "The internship as a whole was a fantastic experience for me. Not only would I recommend it, but I would do so emphatically." "From business etiquette when speaking to clients and partners to actual principles learned in my classes when doing tax returns, it was really cool to see the things that I learned in the classroom come to life in the work environment." "My internship at Diehl has given me an inside look at a different route to pursue in accounting. There is an appeal to a small local firm that serves smaller family owned businesses in a close and trusting relationship." "I was hired for the purpose of inventorying all the fixed assets on the college's depreciable assets list and then adding new assets, bringing depreciation up to date, and then finally adding it to the new fixed asset module within the accounting software." "My internship experience has definitely made me realize that I am in the right field." "I had the opportunity to sit down with a sales representative for a brief meeting which ended with my resume in his hand. From this day on, I feel my career and networking has just begun."